THE ELEVATION/EXALTATION OF THE VENERABLE AND LIFE-CREATING CROSS OF THE LORD. The Elevation of the Venerable and Life-Creating Cross of the Lord: The pagan Roman emperors tried to completely eradicate from human memory the holy places where our Lord Jesus Christ suffered and was resurrected for mankind. The Emperor Adrian (117-138) gave orders to cover over the ground of Golgotha and the Sepulchre of the Lord, and upon the hill fashioned there to set up a pagan temple of the pagan goddess Venus and a statue of Jupiter. Pagans gathered on this place and offered sacrifice to idols there. Eventually after 300 years, by Divine Providence, the great Christian sacred remains -- the Sepulchre of the Lord and the Life-Creating Cross were again discovered and opened for veneration. This occurred under the Equal-to-the-Apostles Emperor Constantine the Great (306-337) after his victory in the year 312 over Maxentius, ruler of the Western part of the Roman empire, and over Licinius, ruler of its Eastern part, becoming in the year 323 the sole-powerful ruler of the vast Roman empire. In 313 he had issued the so-called Edict of Milan, by which the Christian religion was legalised and the persecutions against Christians in the Western half of the empire were stopped. The ruler Licinius, although he had signed the Milan Edict to oblige Constantine, still fanatically continued the persecutions against Christians. Only after his conclusive defeat did the 313 Edict about toleration extend also to the Eastern part of the empire. The Equal-to-the-Apostles Emperor Constantine, having with the assistance of God gained victory over his enemies in three wars, had seen in the heavens the Sign of God -- the Cross and written beneathe: "By this thou shalt conquer". Ardently desiring to find the Cross on which our Lord Jesus Christ was crucified, Equal-to-the-Apostles Constantine sent to Jerusalem his mother, the pious Empress Helen (Comm. 21 May), having provided her with a letter to the Jerusalem patriarch Makarios. Although the holy empress Helen was already in her declining years, she set about completing the task with enthusiasm. The empress gave orders to destroy the pagan temple and idol-statues overshadowing Jerusalem. Searching for the Life-Creating Cross, she made inquiry of Christians and Jews, but for a long time her searchings remained unsuccessful. Finally, they directed her to a certain elderly hebrew by the name of Jude who stated, that the Cross was buried there, where stands the pagan-temple of Venus. They demolished the pagan-temple and, having made a prayer, they began to excavate the ground. Soon there was detected the Sepulchre of the Lord and not far away from it three crosses, a plank with inscription having been done by order of Pilate, and four nails, which had pierced the Body of the Lord. 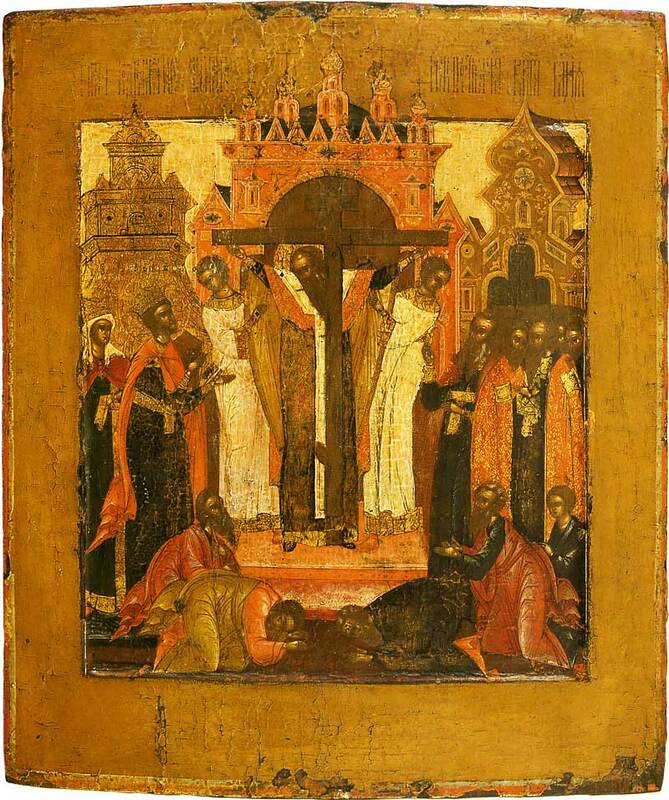 In order to discern on which of the three crosses the Saviour was crucified, Patriarch Makarios alternately touched the crosses to a corpse. When the Cross of the Lord was placed to it, the dead one came alive. Having beheld the rising-up, everyone was convinced that the Life-Creating Cross was found. 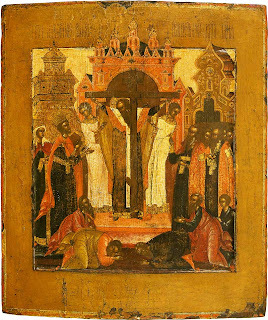 Christians, having come in an innumerable throng to make veneration to the Holy Cross, besought Saint Makarios to elevate, to exalt the Cross, so that all even afar off, might reverently contemplate it. Then the Patriarch and other spiritual chief personages raised up high the Holy Cross, and the people, saying "Lord have mercy", reverently made poklon/prostration before the Venerable Wood. This solemn event occurred in the year 326. During the discovery of the Life-Creating Cross there occurred also another miracle: a grievously sick woman, beneathe the shadow of the Holy Cross, was healed instantly. The starets/elder Jude and other Jews there believed in Christ and accepted Holy Baptism. Jude received the name Kuriakos (ie. lit. "of the Lord") and afterwards was ordained Bishop of Jerusalem. During the reign of Julian the Apostate (361-363) he accepted a martyr's death for Christ (Comm. of Priest-Martyr Kuriakos is 28 October). The holy empress Helen journeyed round the holy places connected with the earthly life of the Saviour -- the reason for more than 80 churches -- raised up at Bethlehem the place of the Birth of Christ, and on the Mount of Olives from whence the Lord ascended to Heaven, and at Gethsemane where the Saviour prayed before His sufferings and where the Mother of God was buried after the falling-asleep. Saint Helen took with her to Constantinople part of the Life-Creating Wood and nails. The Equal-to-the-Apostles Emperor Constantine gave orders to raise up at Jerusalem a majestic and spacious church in honour of the Resurrection of Christ, including in itself also the Sepulchre of the Lord, and Golgotha. The temple was constructed in about 10 years. Saint Helen did not survive until the dedication of the temple; she died in the year 327. The church was consecrated on 13 September 335. On the following day, 14 September, the festal celebration of the Exaltation of the Venerable and Life-Creating Cross was established. On this day is remembered also another event connected to the Cross of the Lord, -- its return back to Jerusalem from Persia after a 14 year captivity. During the reign of the Byzantine emperor Phokas (602-610) the Persian emperor Khozroes II in a war against the Greeks defeated the Greek army, plundered Jerusalem and led off into captivity both the Life-Creating Cross of the Lord and the Holy Patriarch Zacharios (609-633). The Cross remained in Persia for 14 years and only under the emperor Herakles (610-641), who with the help of God defeated Khozroes and concluded peace with his successor and son Syroes -- was the Cross of the Lord returned to Christians from captivity. With great solemnity the Life-creating Cross was transferred to Jerusalem. Emperor Herakles in imperial crown and porphyry(purple) carried the Cross of Christ into the temple of the Resurrection. Alongside the emperor went Patriarch Zacharios. At the gates, by which they ascended onto Golgotha, the emperor suddenly stopped and was not able to proceed further. The Holy Patriarch explained to the emperor that an Angel of the Lord blocked his way, since He That bore the Cross onto Golgotha for the expiation of the world from sin, made His Way of the Cross in the guise of Extreme Humilation. Then Herakles, removing the crown and porphyry, donned plain garb and without further hindrance carried the Cross of Christ into the church. In a sermon on the Exaltation of the Cross, Saint Andrew of Crete (Comm. 4 July) says: "The Cross is exalted, and everything true gathers together, the Cross is exalted, and the city makes solemn, and the people celebrate the feast".